Q. What’s the big advantage with your fluorescent labels [when compared with standard orange labels]? 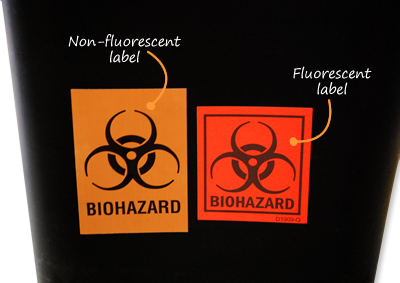 Fluorescent biohazard labels are seen first and remembered best – according to one study. Given an office with many warnings piled ontop of each other, savvy labs use Fluorescent labels to make sure that biohazard instructions are noticed. See the two labels above. It’s tough to really display, on a computer monitor, how much brighter fluorescent labels appear in when seen in reality. But, trust us! Fluorescent labels are bright and get attention. Q. What are the Biohazard Label Regulations? And, whom does it cover? Warning labels shall be attached to all containers used for the storage or transport of potentially infectious materials. The labels shall be orange or red-orange with the biohazard symbol in a contrasting color. Red containers or bags can be substituted for warning labels. [See 29 CFR 1910.1030]. The Bloodborne Pathogens Regulation ([9 CFR 1910.1030] applies to all persons who may reasonably anticipate contact with blood or other potentially infectious materials in the course of their employment. This includes contact with skin, eyes, mucous membranes or contact from piercing the skin. This regulation is mainly focused on compelling employers to create a written Exposure Control Plan in order for the employer to describe to the employees how they will be protected from exposure. Q. How are pathogens and biohazards different? Pathogens are agents that can specifically cause disease. Biohazards are infectious agents or dangerous biological materials that present a risk or potential risk to human health. We offer labels or signs that cover both hazards. Q. How are the Biohazard symbols used in making a Biohazard label? A BioHazard sign needs to contain the symbol shown below, as well as the word "BioHazard" or "Biological Hazard". Q. We help handle evidence in DNA testing. Many investigators typically handle these materials. Should we use Biohazard labels? It is believed that any evidence that entails bodily fluids should be labeled with biohazard labels, tags or tape. These labels help make sure that your civic workers, police and laboratory technicians are aware of the possible health hazards when they handle such samples of evidence, such as the dangers of contracting Hepatitis B and HIV. Q. What are some good procedures for handling biohazards? There are many different types of biohazards, and many different levels of danger. For many hazards, something as simple as household bleach is usable to disinfect environmental surfaces or clean up spills of potentially infectious materials. For a complete description of one procedure for handling biohazards, see the link below. Q. What is OPIM? Is there a special biohazard label for this? OPIM means, other potentially infectious materials. This means that it can be anything that can carry types of pathogenic microorganisms or any other potential risks. There is no specific biohazard label for this because in a sense, it can be anything. Q. In determining when to post a biohazard label, what other toxins should be considered biohazards or pathogens? While HBV and HIV are specifically identified in the Bloodborne Pathogen (BBP) standard (29 CFR 1910.1030), the term includes any pathogenic microorganism that is present in human blood or OPIM and can infect and cause disease in persons who are exposed to blood containing the pathogen. Pathogenic microorganisms can also cause diseases such as hepatitis C, malaria, syphilis, babesiosis, brucellosis, leptospirosis, arboviral infections, relapsing fever, adult T-cell leukemia/lymphoma (caused by HTLV-I), HTLV-I associated myelopathy, diseases associated with HTLV-II, viral hemorrhagic fever, and West Nile Virus. Although not a microorganism, Creutzfeldt-Jakob disease can be transmitted through blood. Q. Should I use a paper or a plastic hazardous waste label? In most cases, we recommend that you use a plastic or vinyl hazardous waste label material. We have heard about an event that occurred with a paper hazardous waste label (not one of ours). The paper label failed and, allegedly, the 55 gallon drum (which used to contain hazardous materials) became a convenient pit for a barbecue grill. Similarly, we have heard about a case wherein a hazardous waste drum became a trash can for the neighborhood. Given risk, we encourage you to order the most durable label possible. Plastic labels are far more resistant to water, sun and chemicals than paper labels. Labels are a first line defense against these dangers. In all cases, though, test the label, the label adhesive and your marker. Q. Do your vinyl [Hazardous Waste labels] labels have a writable surface? Can we use a pencil? Or, do we need to use a pen or marker? You must use a pen or permanent marker. They are not pencil writable. Q. Some of the labels do not seem to stick well on our older drums, when they are wet or dirty. Do you have any suggestions? Preparation is critical. Sticking a hazardous waste label onto a poorly prepared surface is like trying to paint a dirty gutter — the label is just not going to stay stuck for very long. Remember how important all the scrapping was when you repainted your house! For the best results, we recommend using a cleaning solution and a Scotchbrite pad. Remove oils. Rough up the surface slightly. You will be amazed at how much difference a simple cleaning will make. Q. In determining when and how to label a package of hazardous materials who has responsibility? • Determine the material's Hazard Class. • For materials with more than one hazard, select the primary and subsidiary hazards. • Choose the NOS ["Not Otherwise Specified"] shipping name which best characterizes the material. Examples of N.O.S. names are the generic chemical name (for example, "Alcohols, toxic"), the generic use of the chemical (for example, "Refrigerant Gas") or the a description of the generic hazards of the material (for example, "Flammable Liquid"). Q. When did 215A do into effect? OSHA is hereby issuing a final rule that requires employers who receive a package, transport vehicle, freight container, motor vehicle or rail freight car which contains a hazardous material and which is required to be marked, placarded, or labeled in accordance with the U.S. Department of Transportation's (DOT) Hazardous Materials Regulations, to retain the markings, placards, and labels on the package, transport vehicle, freight container, motor vehicle or rail freight car. Such markings, placards and labels generally must be retained on packages until the packaging is sufficiently cleaned of residue and purged of vapors to remove any potential hazards and retained on transport vehicles, freight containers, motor vehicles or rail freight cars until hazardous material which requires the marking or placarding is removed therefrom. This rule is issued pursuant to section 6(b) of the Occupational Safety and Health Act of 1970 (the Act) and in accordance with section 29 of Public Law 101-615, the Hazardous Materials Transportation Uniform Safety Act of 1990 (HMTUSA). Q. Our drums seem to have more than one hazard. In this case, which label should takes preference? In most cases, the rules of "Hazard Precedence" outline which hazard must take the lead. For example, poisonous gas hazards (Division 2.3) takes precedence over the corrosive hazard described in Class 8. See the question below. Please consult with your legal and hazmat expert, of course. Q. What is the history and background behind our need to be so careful with DOT labels? The first law requiring labeling of hazardous materials on railroads was passed in 1910 based on the continual transportation of explosives. The labeling changed very little over the next 60 years, until, after a number of highly publicized accidents during transport, Congress finally passed the Hazardous Materials Transportation Act in 1975. This soon led to the brief consolidation of regulations under the Hazardous Materials Regulations Board. However, during the remainder of the 70s and 80s, numerous regulatory changes have been taking place over the years and it has been an ongoing challenge to simplify and consolidate them. Recently, the DOT and UN have both made standard that seems to be successful and the consistency has certainly risen. The two sides began to cooperate together when the DOT accepted the recommendation by the UN that labeling standards and "performance packaging" with HM-181 is now reaching a conclusion with HM-215A. The UN distributes their recommendations worldwide, and though they do not have the power of regulations, they have a great influence in it because of their worldwide distributions. They are adopted by various countries, such as the acceptance of HM-215A in the U.S. Their recommendations have now spread so that they cover virtually all international modal regulations, including the International Maritime Dangerous Goods Code (IMDG Code) for international sea transport and the ICAO instructions for international air transport. The U.S. DOT's HM-215A was issued on December 29, 1994 and it brought the US regulations in line with the UN recommendations. By October 1, 1996 all DOT specification packaging may no longer be used. By October 1, 2001 all HM-181 placards specified in the December 1990 rule will need to be replaced by those meeting the HM-215A rules. • Regulations have been consolidated. Consistency has been the goal of every regulatory change, and finally, it seems that has come to fruition. This consistency has been accomplished by acquiring different local and sate regulations that work together, by aligning our standards with those of other countries, and by attempting to simplify the different labeling requirements for each mode of transportation. At one point the Coast Guard, the FAA, the Federal Highway Administration and the Federal Railway Administration each had their own marking requirements. • U.S. DOT label designs are now also international labels. As the acceptance of the eighth edition of the UN Recommendations passes, these labels can be used for international shipments. • DOT labels now show much more information as well. It has added the ID number, the N.O.S. shipping name and the constituent names. Thanks to electronic data files, the DOT symbols can now be found integrating with MSDSs as well as many shipping papers. Q. What are the rules HM-181, HM-215 and why are these rules important for us? What are the size specifications for these hazardous materials labels? These labels should be at least 3.9" (100mm) long. Plus they need to have a solid inner border line that is 0.2" to 0.25" (5-6.3mm) from the outer edge of the label. Many labels now show the UN/NA ID number, the generic description of the material and the technical name of the chemical. Here is some background on these two citations. First, let's start with some history. Hazardous materials regulations have grown considerably over the last thirty years. In the first iterations, many believed that these regulations were far too complex and inflexible. To some, these standards did not easily incorporate the new non-bulk packaging methods. And they did not always agree with the international U.N. recommendations. As a result, the DOT's RSPCA group proposed a sweeping array of sweeping changes, as can be seen in docket HM-181. Understand, though, that not all recent changes are"HM-181 regulations" There are many, other, related dockets. These regulations were eventually passed and can be found in the Hazardous Materials Regulations, 49 CFR parts 172 to 180. These are the important source documents for DOT shipping labels. HM-215AS is the final rule and aligns U.S. regulations with the UN Recommendations. Q. When should ORM labels be used? Unless offered or intended for transportation by aircraft, Acetaldehyde ammonia is excepted from labeling when transported in a limited quantity. As a solid, the net capacity of the inner packaging should not be over 5.0 kg (11 pounds) each, and should then be packed strong on the outer packaging. Once these requirements are met, the packages must meet another requirement so that it is considered a "consumer commodity." A consumer commodity is simply a material that is packaged and distributed with the intent to sell through retail services, or to be consumed by an individual for personal care or for household use, for example, drugs and medicines. If this is true of your package, then you may use an ORM label in order to ship your materials. The shipper, typically has this responsibility. The shipper needs to: • Check that the material can be shipped (and is not forbidden) • Determine the material's Hazard Class. • For materials with more than one hazard, select the primary and subsidiary hazards. • Choose the NOS ["Not Otherwise Specified"] shipping name which best characterizes the material. Examples of N.O.S. names are the generic chemical name (for example, "Alcohols, toxic"), the generic use of the chemical (for example, "Refrigerant Gas") or the a description of the generic hazards of the material (for example, "Flammable Liquid"). Q. How is an RTK label different from the MSDS? Note that the Hazard Communication Standard is performance-oriented standard. As a result, you will not find specifications on the exact design for our Right-to-Know label (or even your MSDS). Thus, labels and MSDS' follow many different formats and there can be no side-by-side comparison made between the information placed on the MSDS versus a label. To gain more insight, however, review the following excerpt from a July 25, 1991 letter from Patricia K. Clark, Director, Directorate of Compliance Programs at OSHA:"A material safety data sheet is not an "appropriate hazard warning"; the purpose of a label under the HCS is to serve as an immediate visual warning of the hazards associated with the chemical. The identity of the chemical leads to the more detailed information on the MSDS, but the hazard warning gives immediate information to employees working with the substance about the hazards associated with exposure." Of course, an entire MSDS cannot fit onto your RTK label. Vital information can be lost in the clutter of a badly organized label. RTK labels should make searching through the MSDS easier. A label is, a just a single component of your hazardous communication system. No doubt, it is the tangible evidence of a RTK system that spans not only the chemical database, your MSDS's, emergency response protocols and protective equipment and handling training. For many of the comprehensive label designs that we offer in our custom RTK label section, each area of a label links to a particular section of the 16-part MSDS. By creating a way to connect the label and the MSDS, and adding an MSDS reference to the label, the MSDS becomes less intimidating. Q. Should RTK labels cover the worst case scenario? RTK labels are not written to cover every exposure situation. Instead, they are made for the worst-case situations. Many times that Safety Officer can decide to make the PPE requirements more flexible when a substance is handled in small enough quantities that they do not present any danger. • In situations when small quantities are used, a lab coat or apron is adequate enough to shield the body from contamination. However, many labels still have the full body suit symbol and are written for the worst-case exposure situations as a precaution. Full body suits are generally used to protect one from liquid a corrosives as well as other liquids and solids that can potentially harm the host human, and gases which have the ability to invade the body through absorption or form corrosive mixtures with moisture. • It is recommended that gloves be worn at all times when handling chemicals. This is a principle rule when managing with various gases. Many gases, when placed under extreme pressure or very low temperatures turn into liquids. Should these compressed gases be released and make contact with a human, frostbite will likely occur. Gloves are greatly suggested for that reason, as well as to stop one from touching their eyes while chemicals still reside on their hands. Q. What is meant by the "Health Hazards" that are shown on RTK labels? Toxic: A chemical falling within any of the following categories: (a) A chemical that has a median lethal dose (LD50) of more than 50 milligrams per kilogram but not more than 500 milligrams per kilogram of body weight when administered orally to albino rats weighing between 200 and 300 grams each; (b) A chemical that has a median lethal dose (LD50) of more than 200 milligrams per kilogram, but not more than 1,000 milligrams per kilogram of body weight when administered by continuous contact for 24 hours (or less if death occurs within 24 hours) with the bare skin of albino rabbits weighing between two and three kilograms each; (c) A chemical that has a median lethal concentration (LC50) in air of more than 200 parts per million, but not more than 2,000 parts per million by volume of gas or vapor, or more than two milligrams per liter, but not more than 20 milligrams per liter of mist, fume, or dust, when administered by continuous inhalation for one hour (or less if death occurs within one hour) to albino rats weighing between 200 and 300 grams each. Highly Toxic (Poison): A chemical falling within any of the following categories: (a) A chemical that has a median lethal dose (LD50) of 50 milligrams or less per kilogram of body weight when administered orally to albino rats weighing between 200 and 300 grams each. (b) A chemical that has a median lethal dose (LD50) of 200 milligrams or less per kilogram of body weight when administered by continuous contact for 24 hours (or less if death occurs within 24 hours) with the bare skin of albino rabbits weighing between two and three kilograms each. (c) A chemical that has a median lethal concentration (LC50) in air of 200 parts per million by volume or less of gas or vapor, or 2 milligrams per liter or less of mist, fume, or dust, when administered by continuous inhalation for one hour (or less if death occurs within one hour) to albino rats weighing between 200 and 300 grams each. Irritant: A chemical, which is not corrosive, but which causes a reversible inflammatory effect on living tissue by chemical action at the site of contact. A chemical is a skin irritant if, when tested on the intact skin of albino rabbits by the methods of 16 CFR 1500.41 for four hours exposure or by other appropriate techniques, results in an empirical score of five or more. A chemical is an eye irritant if so determined under the procedure listed in 16 CFR 1500.42 or other appropriate techniques. Corrosive: A chemical that causes visible destruction of, or irreversible alterations in, living tissue by chemical action at the site of contact. For example, a chemical is considered to be corrosive if, when tested on the intact skin of albino rabbits by the method described by the U.S. Department of Transportation in appendix A to 49 CFR part 173, destroys or changes irreversibly the structure of the tissue at the site of contact following an exposure period of four hours. This term shall not refer to action on inanimate surfaces. Carcinogen: A chemical is considered to be a carcinogen if: (a) It has been evaluated by the International Agency for Research on Cancer (IARC), and found to be a carcinogen or potential carcinogen; or (b) It is listed as a carcinogen or potential carcinogen in the Annual Report on Carcinogens published by the National Toxicology Program (NTP) (latest edition); or, (c) It is regulated by OSHA as a carcinogen. Q. How do I learn more about RTK label regulations? What is the purpose behind the OSHA HazCom rules? To ensure that the hazards of all chemicals produced or imported are evaluated, and that information concerning their hazards is transmitted to employers and employees. This transmittal of information is to be accomplished by means of comprehensive hazard communication programs, which are to include container labeling and other forms of warning, material safety data sheets and employee training. The HazCom rules typically reach the #1 cited ranking for OSHA violations. The label, unfortunately, is only part of the solution. Training and record keeping are critical. Q. What are the physical hazards for my Right-to-Know chemical label? • Corrosive. Does the material destroy living tissue when contacted? Review the NFPA rating for Health Hazard. See Section 3 of the MSDS. Also determine if the material is an organic peroxide. • Explosive. See Sections 3, 5 and 10 of the MSDS. Will the material explode when heated, shocked, or mixed with water? Consider how the material will polymerize or whether there could be explosive dust-air mixtures. You also may want to indicate, in particular, if the material is "Unstable" or "Water Reactive" or an "Oxidizer"
• Flammable. Is the material flammable and what term do you want to use (combustible liquid, flammable gas, flammable liquid/solid, or Pyrophoric? See Sections 3, 5 and 10 of your MSDS. Also consult with ANSI Z129.1-1994 for detailed explanations of Flammability. A pyrophoric material ignites spontaneously in dry or moist air at or below 54.4ºC? Also see What is a Flammable Liquid? • Poison. Is the material highly toxic? See ANSI Z129.1-1994 for definitions of when a material is highly toxic. See Sections 3 and 11 of your MSDS. • Radioactive. See Sections 3 and 10 of your MSDS. Q. Should we use Right-to-Know labels in Spanish? Paragraph 29 CFR 1910.1200(f)(8) states: "The employer shall ensure that labels or other forms of warning are legible, in English, prominently displayed on the container, or readily available in the work area throughout each work shift. Employers having employees who speak other languages may add the information in their language to the material presented, as long as the information is presented in English as well." RTK labels are required to be written in English. It is allowed to write them in other languages as well, but the rule does not demand it. Q. I am unclear. Does OSHA require target organ information on RTK labels? "As you know the HCS requires that a chemical shipping label must contain the identity of the chemical, an appropriate hazard warning, and the name and address of the responsible party. The agency's position stated in the current compliance directive (CPL 2-2.38C) is: "Precautionary statements such as "caution", "danger" or "harmful if inhaled" are not hazard warnings. The definition of hazard warning states that the hazard warning must be included on the label and must specifically convey the hazards of the chemical. OSHA has consistently maintained that this includes target organ effects." Q. How do I determine which Target Organs I should select for my RTK label? Consult Section 3 of your 16-part MSDS. Also look over Sections 11 and 6 to obtain possible additional information on Target Organ effects. This should help to find out what Target Organs to select for your label. Q. What does the "Route of Entry" mean when I fill out an RTK label for my chemical? Inhalation: Chemicals may be inhaled into the lungs and then released into the bloodstream. Ingestion: Chemicals may invade the bloodstream after ingestion if it is absorbed through the small intestine, stomach, and the other sections of the digestive system. Skin Absorption: Chemicals may absorb chemicals on contact. Eye or Skin Contact: Chemicals on contact may affect the skin or eye. Q. In looking at our RTK labels, how Target Organ effects determined? The following is categorized into the target organ effects that may occur in the presence of specific chemicals. It also includes examples of those specific chemicals as well as some of the signs and symptoms that may come about. The examples below show the various hazards possible in the work place and are made to help employers see the danger involved in these chemicals. Q. In filling out the template for RTK labels, how do I determine which Personal Protective Equipment should be shown? Locate section 8 n your 16-part MSDS. See the recommendations here and use these choices when you click on the Personal Protective Equipment ["PPE"] options shown on the custom RTK label Wizard. Eyes: Use safety "Glasses" when presented with substances that cause mild irritation to the eyes. Use "Goggles" for liquid or solid substances that irritate, severely irritate or corrode the eyes as well as for gases that are able to cause frostbite. Face: Use a "Face Shield" for 'corrosive' materials. Hand: It is recommended that "Gloves" be worn at all times. However, one must be aware of using the correct type of glove with specific substances. Body & Feet: Use a "Full Suit" for "corrosive" materials that are "toxic" or "highly toxic" to the organs if one is exposed for too long. Use an "apron" should a full suit be unavailable. Respirator: Consult Section 8 of 6-part MSDS. • When using a respirator, one must judge the potential exposure level and use the appropriate respirator for each level.